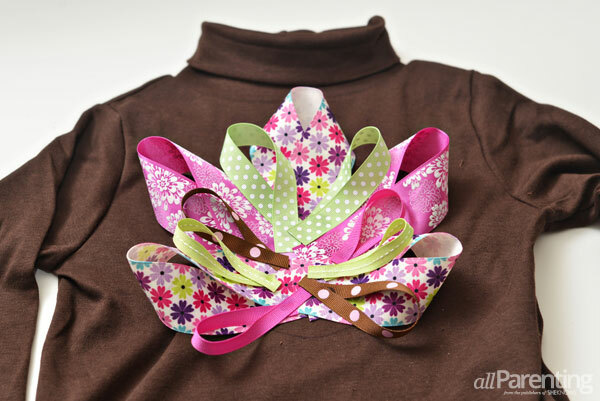 With a few ribbons and a little fabric, you can craft the perfect outfit for your little one for Thanksgiving! Cut a rectangle out of the corduroy that is slightly larger than you want the body of the turkey to be. 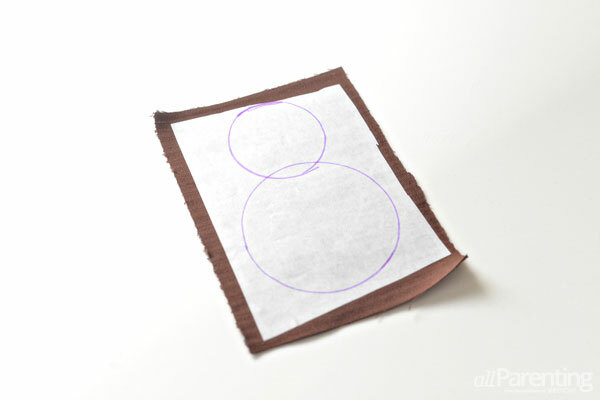 Cut a piece of fusible interfacing that is slightly smaller than the rectangle. 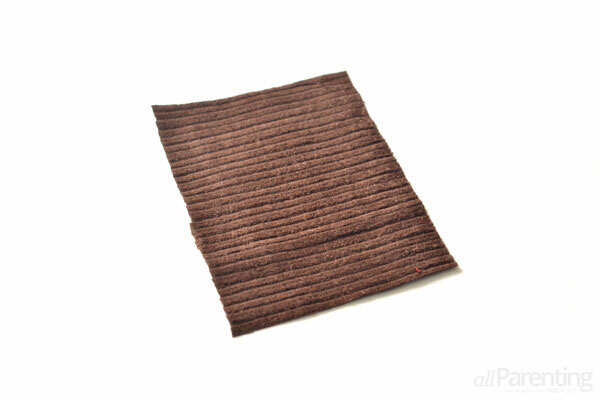 Heat up your iron and fuse the non-paper side of the interfacing to the back of the corduroy. Next, draw the body of the turkey on the back of the fabric. I traced around two circular objects to make the body and the head. 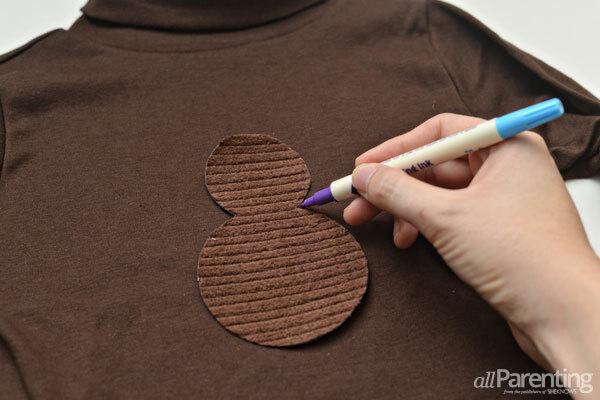 Cut out the shape of the turkey's body, and then trace around the body on the shirt with the fabric marking pen. Cut several pieces of ribbon that are six inches long. 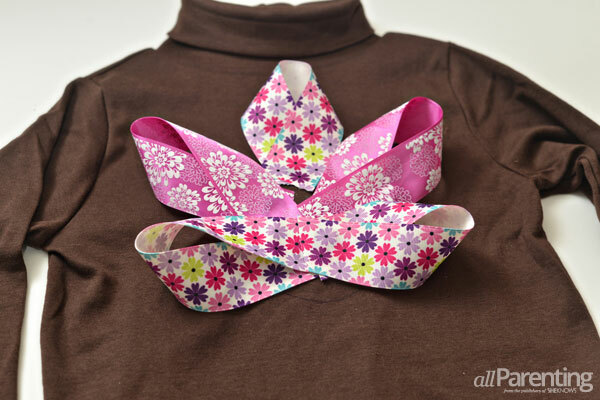 Loop the ribbon so that the ends meet and use the fabric glue to glue the ribbons in place. 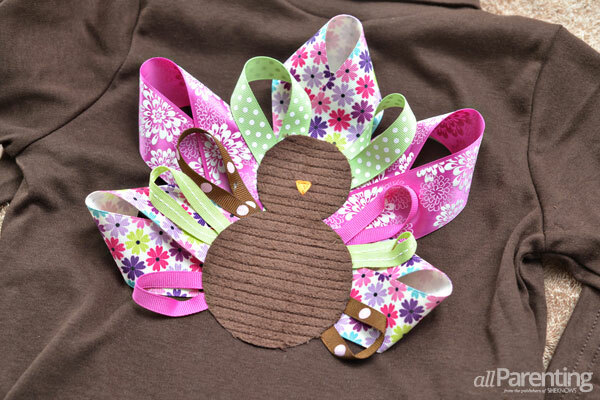 Make sure you glue the ends of the ribbon inside the traced outline of the turkey's body. 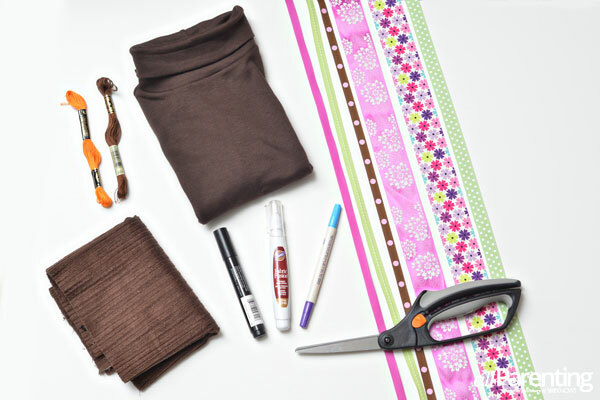 Cut out strips of ribbon that are four inches long, and glue them on top of the first layer of ribbon. 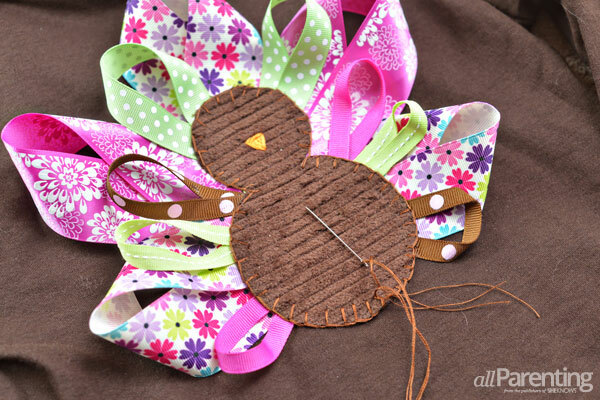 Use three strands of orange embroidery floss to embroider a beak on the turkey's head. Next, peel the paper backing off of the interfacing on the back of the turkey. Place the turkey over the top of the ribbons and iron the body in place. 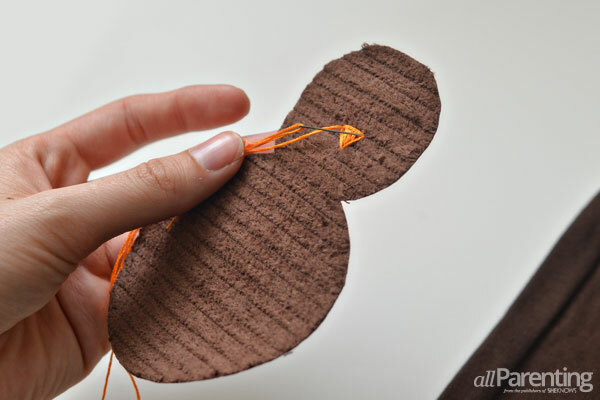 Using the brown embroidery floss, stitch a decorative stitch such as a blanket stitch (click here for instructions) to secure the edges of the turkey. 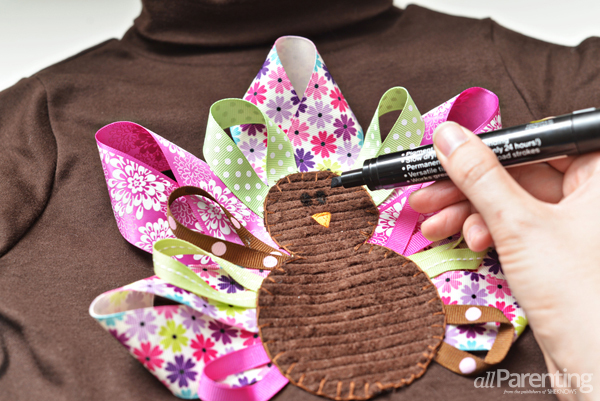 Use the black permanent fabric pen to draw two eyes on the turkey. 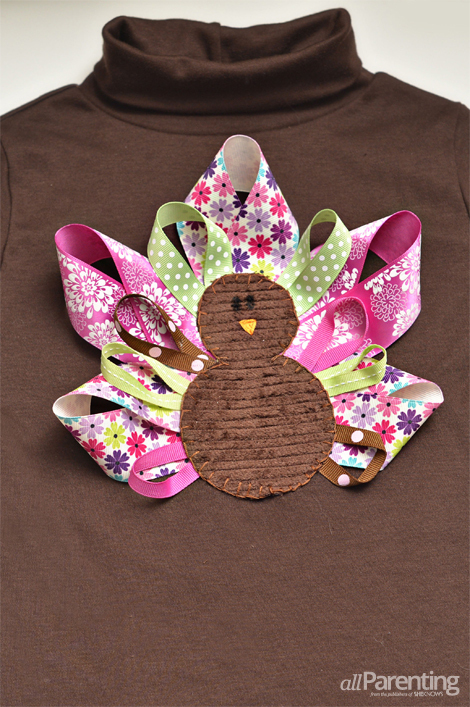 Let the turkey T-shirt sit for 24 hours before washing or wearing.